- ER 6.5 2 way system newly released. -Mercedes Benz replacement speaker: MB 4SS newly released from August ! -BMW replacement speaker: BFD 0470AL release on Dec.
Phass is the car audio division of FT Trading Ltd. which is based in Nagano, Japan. we began our foray into car audio when, believing that we could produce products that surpassed the sound quality of products we previously heard, we began the development of the RE2 amplifier, in the Spring of 1994. The RE2, which functions as a constant current driving, non-negative feedback amplifier, was completed in 1996 and Phass was born. A year later we began selling speakers to complement the RE2 amplifier. 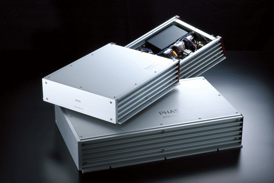 Today Phass manufactures and sells three lines of amplifiers, with the RE line resting at the top, along with a full complement of speaker systems, most of which utilize Japanese developed materials. The top speaker models are distinguished by the use of rare alnico magnets. Phass designed and assembles all its products in Japan, by hand. We manufacture audio equipments distinguished not by cosmetics and outrageous power specifications, but by their ability to reproduce music with a great sense of realism and naturalness with real world specifications. Therefore our slogan: "Making Music Sound Real." After 20 years working with car audio, I can say it is the "PINNACLE" of full range speakers. Its sound is absolutely real, it has total clarity and transparency....sound with richness and depth....I found new sounds from my traditional records....all musical instruments take a new life just after putting PF 13.The sound stage changed dramatically....it is much more detailed....deeper with great presence.A high frequency sound that I have been looking for appeared very smoothly and extended ideally.The low frequency sound is graceful. I will never leave hold of PF 13 in my car.